Piracetam is the fundamental compound in the 'racetam' family of nootropics (compounds that enhance mental functions, such as memory or awareness). The compound has an extensive history of use as a treatment for various cognitive issues, and extensive use as a supplement for enhancement purposes. In Europe, it is actually a prescription drug named Nootropil, which provides us with several thorough safety studies. It is legally sold in the United States, but cannot be marketed as a "dietary supplement". The Piracetam Benefits -- What does it do? Piracetam's benefits are numerous and extend beyond just nootropic effects. Keep in mind that as with all nootropic supplements this is no miracle drug, however the effects should be noticeable and significant. While other racetams are known anecdotally for their more rapid onset of effects and sometimes specific mental boosts, piracetam's effects are more general and steady in nature. Numerous other studies have been done showing improved short term memory and cognitive function as shown in this meta-analysis. Piracetam also shows promise as a defense against cognitive decline in aging patients, as well as those with dementia and alzheimer's. In several studies, it is shown to significantly attenuate the deterioration of cognitive function as a result of these diseases. While not studied specifically in humans for this effect, there is a great deal of anecdotal reports for piracetam, among other racetams, in reducing anxiety. This is great news because current anti-anxiety pharmaceuticals are almost all linked with significant cognitive deterioration with long term use so alternatives without these negative side effects are ideal. Attenuating the neuronal damage and lipofuscin build-up as a result of chronic alcohol consumption. The mechanisms of action for Piracetam and racetams as a category are not fully known, however a number of studies have been carried out in an attempt to elucidate on them. Increased brain oxygen consumption was noted in studies involving piracetam, which is usually indicative of increased glucose metabolism. Follow up studies in both rats and humans confirmed this belief. It is noted that the increase in cerebral glucose consumption were especially significant in test subjects that suffered from Alzheimer's. Glutamate receptors are excitatory neurotransmitters which cause synaptic plasticity, an essential step in the regulation of learning and formation of memories. Piracetam acts as an allosteric modulator of AMPA-glutamate receptors, while only minimally stimulating the NMDA receptor and not affecting Kainate glutamate receptors. Specifically, piracetam modulates the Glu2 and Glu3 subtypes of the AMPA-receptor class. Positive modulation of these receptors can also result in greater calcium influx into neurons and increase the density of AMPA-receptor binding sites. This is also how noopept, a similar brain enhancer works. The benefit of noopept is that it requires far lower doses (ie 10mg!) and has been shown to yield slightly less side effects, as discussed in our noopept blog post linked above. Piracetam improves the function of acetylcholine (a potent neurotransmitter) by regulation of muscarinic acetylcholine receptors. These receptors are utilized in the formation of memories, as well as other brain functions. This possibly explains the demonstrated effect of piracetam reducing free acetylcholine levels in the brain, while increasing levels of its precursor choline in the hippocampus although specific study in this area has not happened. Piracetam is highly bioavailable with near 100% absorption from oral consumption. It reaches peak plasma levels around 1.5 hours after oral ingestion, with a half-life of around 5 hours. This puts it in the middle among the racetam compounds compared to the more rapidly excreted such as aniracetam (1.5 hours) and the slower such as oxiracetam (8 hours). Around ⅔ of the oral dose is excreted intact in the urine with no further metabolism, this is notably different than aniracetam, which is highly metabolised into biologically active metabolites in the body before excretion. For adults, piracetam has been studied at doses ranging from 1200-4800mg daily. The maximum effective dose in studies appears to be 1600mg taken three times daily. Piracetam is water soluble and highly bioavailable so it does not need to be consumed with food. You should start with a low dose of piracetam and gradually work your way up to the full dose. Large doses of piracetam right away has resulted in many anecdotal reports of headaches, probably due to acetylcholine depletion. As mentioned earlier, piracetam can deplete levels of acetylcholine in the brain, so co-supplementation with an acetylcholine enhancing supplement such as citicholine or Alpha-GPC is recommended and shown in some studies to enhance the nootropic effects of piracetam. This is also a great way to minimize the chance that you get headaches when starting piracetam supplementation. Combined as a multi-ingredient drug, the cerebrovascular effects of piracetam and cinnarizine on cerebral oxygen consumption are said to be synergistic. This has not been studied, however each compound on their own has been shown to attenuate hypoxia-induced damage to the brain, as well as to increase cerebral oxygen consumption. Cinarrazine is a prescription drug in the United States, but is sold over the counter in Europe. In the US, it is uncommon to add to the stack - the cholinergics listed above are just fine. Repeat: Piracetam is not a stimulant! A suitable nootropic replacement for caffeine is adrafinil. While certainly stimulatory, at low doses, it does not raise heart rate or blood pressure like caffeine does - benefits that some may enjoy. At the end of the day, the typical piracetam stack for beginners will involve citicoline or alpha GPC, some caffeine, and perhaps some ALCAR, or Acetyl-L-Carnitine. What about an "Attack Dose"? Some sources have suggested to do an "attack dose" of piracetam, which is to take a high dose in the beginning. Some do 2-3g three times a day on the first day, and then go back to the levels recommended above. The idea is that your body is not yet familiar with the substance, so you give yourself a higher dose than you're going to be taking daily to "kick-start" the process. We Believe that Attack Doses are bad ideas. The reason being, a beginner may quickly deplete their acetylcholine, and get side effects that just weren't worth the possible benefits mentioned above. If you are going to do this, definitely do it with an acetylcholine precursor mentioned above, but we advise against attack dosing in general with nearly all supplements. In general, users who take it properly -- as mentioned above with the stack section -- love it. However, improper use, or other mental conditions could overshadow its benefits, making it less cost-effective to a small portion of users. The Taste, Oh the Bitter Taste! Put piracetam on the tip of your tongue (avoiding the bitter receptors on the back of your tongue) and quickly shoot it back with a flavored fluid. Deal with it. We occasionally mix it with Scivation Xtend, one of our favorite amino acid drinks. Piracetam, and all racetams, are generally well tolerated by humans although there are relatively common side effects such as anxiety, insomnia, drowsiness, and agitation. In an 18 month study in humans at 3.2g daily, as well as a year long study at 8g daily, no major adverse effects were reported. In three different animal models(rodent, dog, marmoset) a LD50 was not accomplished even at doses as high as 8g/kg. This combined with the long term human interventions indicate a very high level of safety for the compound. However, these statements are not approved by the FDA and do not constitute medical advice. You should always talk to your doctor before beginning this or any other supplement regimen. Once again, piracetam depletes acetylcholine levels in users brains. This means that you should stack it with a choline supplement such as Alpha-GPC, citicholine (choline CDP), or other (but the previous two are most common). Avoiding to properly stack this, or taking too high of dosages and depleting ones self of acetylcholine can lead to headaches. Caution should be taken if you on a prescription blood thinner or potent blood thinning supplement. 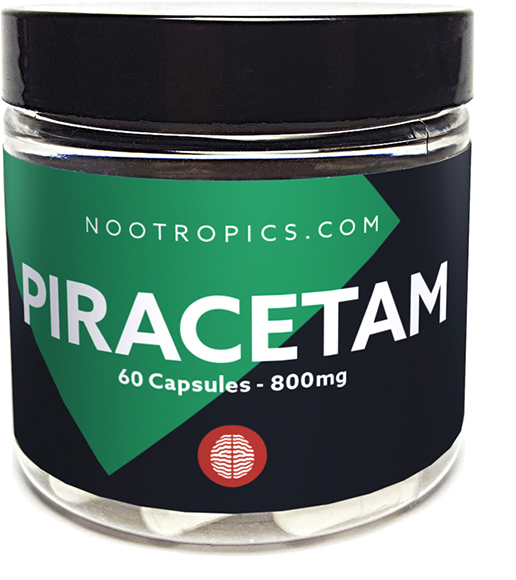 Piracetam has a negative effect on platelets and can reduce blood clotting. And thinning the blood too much brings the potential for a number of negative effects. Piracetam can increase the excitation of NMDA-glutamate receptors, and both Adderall and Modafinil can increase levels of free glutamate in the brain. The overexpression of NMDA receptors in the brain can be neurotoxic. Additionally, a number of anecdotal reports from people who have stacked either of these drugs with piracetam are full of negative effects and personal horror stories. Therefore if you are prescribed Adderall it is not suggested that you take piracetam. Buying nootropics can be tricky. Racetams are not legally banned from the supplement marketplace, but the FDA has been known to crack down on sellers so different brands come and go frequently. Customs also has been known to seize shipments of piracetam making the investment a risky one for companies. There has also been quality issues with various brands in the past so picking out the best piracetam supplements can be difficult. We'll do our best to keep our price comparison here up to date with links to trusted stores where you can buy your piracetam online. You will definitely not be able to find piracetam at the chain supplement stores such as GNC or Vitamin Shoppe, and even if your local independent nutrition store sells it why not save a bunch of money by buying online. This seemingly has no effect on the product's legality, but if readers ever wonder why piracetam product descriptions are blank or extremely vague -- this is why. Piracetam was actually the first nootropic drug ever developed and is the compound from which the word "nootropic" was inspired. It was first synthesized in 1964 by scientists at a Belgian pharmaceutical company, led by researcher Corneliu E. Giurgea. The term nootropic was later coined by Giurgea in 1972 to refer to piracetam and similar drugs by combining the Greek words noos (meaning Mind) and trepein (meaning to bend/turn). Sign up for future Piracetam news! Click the button below to sign up for future Piracetam news, deals, coupons, and reviews!